One thing you need to know before you get started repairing your clothes dryer is that most problems that occur with dryers is caused by the vent being stopped up. So after you make necessary repairs, check your vent and remember to always clean out your lint trap each time you use your clothes dryer. The procedures for clothes dryer repair vary greatly depending on the manufacturer. So, the first thing you must know is the manufacturer of your clothes dryer. Over the years, appliance companies have merged, split up and gone out of business. This may cause some confusion, for example Whirlpool manufactures Roper brand. 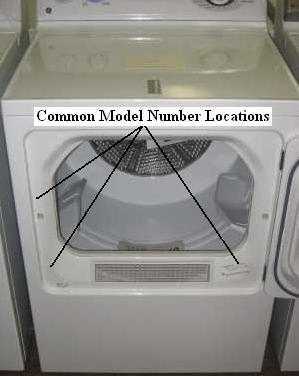 Therefore, if you have a Roper dryer you must look at the Whirlpool dryer repair section. The next thing you need to know is the exact problem that is occurring with your dryer. First check your clothes dryer to see the exact problem. Then look at the list below of problems that commonly occur with dryers and click on the one that best describes its problem. It’s important that you get this right because I will be asking you to check parts unnecessarily if you click the wrong link. But don’t worry you can always start over. If your gas dryer is not heating click here Gas Dryer Repair Guide. Note if your gas dryer has any other problem choose from the links below. I hope these pages help you with your clothes dryer repair.